In the book A Dictionary of Cromer and Overstrand History you'll find just how many schools there have been in the town over the years. However, in spite of the large number of private schools, the majority of children growing up in Cromer from the 1890s onwards went to the Board Schools, founded to provide education for all as a result fo the Education Acts of the 19th century. The three Board Schools were on one site in Louden Road. In the 21st century the buildings are all still there but have been converted to the private houses of Norman Trollor Court. From 1947, the separate Infants, Girls and Boys schools were restructured into the Infant and the mixed Junior School, the arrangement that continues today on their respective present sites. In 1977 former Cromer Junior School Headmistress Kate D.L.Barrett researched and published Cromer Girl's School - A History. This deals specifically with the Girl's School from 1872 to 1947. Miss Barrett will be fondly remembered by many, feared by some but respected by all as a teacher at the Girl's School and the first Headmistress of the combined Junior School. For those who attended the Junior School under the tutelage of Miss Barrett, the concept of an international network joining computers together would have seemed highly unlikely! The main concern was to ensure the inkwell at the corner of the desk didn't let you down and that you didn't create ink blots when writing. The following text of her book remains in the copyright of her assignees but we are confident that she would be more than happy that it is reproduced here. If you have stories of time spent at the Girl's School or at the subsequent Junior School, please make use of the feedback pages and we will add them to this section of the site. Until 1949, when re-organisation took place, the present Junior School, situated in the centre of Cromer, housed three separate departments, each with its own Headmaster or Headmistress. The Boys' School had its entrance in Louden Road, the Infants' in the Loke, and the Girls' School in Cross Street. There was an extra entrance in Bond Street, which led to the Board Room, in which the School Board (and later the School Managers) met to discuss the business of the three schools. Before the existence of this building, however, there was an earlier Girls' School, situated approximately where the Parish Hall now stands, and which was owned and run by the Church. This school is known to have existed as early as 1854 and may have been there even before this, but the only written evidence (as far as I know) is the Log Book which dates from 1872. The first Parliamentary Act granting aid for elementary education was made in 1833; the Act of 1870 went further, and presumably it was then that the Vicar of Cromer, the Rev. Frederic Fitch, was prompted to apply for a grant to help to finance the running of his school. To obtain this he had to agree to certain stipulations, e.g. the Headmistress must be qualified, the school must be inspected and examined yearly by one of Her Majesty's (Queen Victoria's) Inspectors of Schools, and must satisfy him of the standard of work required, and a Log Book must be kept in which the Headmistress must make daily entries recording anything which affected the life of the school. Later on the entries were made weekly, and later still, at the discretion of the teacher, who judged whether the item was worthy of note. Thus it may be seen that although valuable as a means of forming an idea of the schools of that period, such a Log Book was no means complete, as it did not record anything which happened outside the school hours, and in later years much did happen after school hours; concerts, visits, Jumble Sales, and Sports Practices, to name but a few. So, as this old Log Book is the main source of the existence of this early Girls' School, this history, incomplete as it is, is nevertheless of interest in giving a picture of what went on in schools at that time. The old Log Book and the one which followed, tell of eight Headmistresses over a span of seventy-seven years. Each will be dealt with separately, trying to give a picture of the kind of school which existed then, the subjects taught and the kind of people who taught them. "April 2nd. Entered on duties as Mistress of Cromer Girls' School.". Such a bald statement of such an important event, for it fell to the lot of this unknown woman to establish a recognised school and transform it from its somewhat neglected state into one more nearly conforming to the standards required in that day. Whether she succeeded or not I shall endeavour to point out, following the thirty-eight pages of daily recordings in a neat, clear script which scarcely varies, noting and commenting upon absences from school and their causes, punishments meted out, numbers in classes, progress or otherwise of her pupils, visitors to the school, and countless references to Religious Instruction, which, as a Church School, formed a most important part of her work. This was in addition to the three R's, as they came to be known in later years, plus Spelling, and these four subjects formed a basis of elementary education at that time. History is only referred to as a reading exercise, Geography consisted of learning long lists of rivers, mountains, counties and towns by heart, while Singing formed an occasional diversion, and Physical work appears only as a mention of "marching" in the playground. Even after reading the first page or two of Miss Colls' entries in the Log Book it is possible to form an estimate of her character, for her comments show that she was conscientious and painstaking, as she diligently examined each class in turn on all the basic subjects, to satisfy herself on the general standard of proficiency, and (as I suspect) to make it clear to a visiting inspector of the state of affairs when she took over, for it is evident that all was not well with this school, and she was obliged to be strict and insist on quietness and diligence; as well she might, for at least three classes were working in the same room, and whether they were separated by any sort of partition from the Infants is doubtful when reading 'between the lines'. As for the numbers concerned, nowhere are they given in their entirety, and we can only guess at the size of the school by being told, "Full attendance in 3rd class. (41)", or "Dec. 4th (1873) Average for week higher - 106. ", and as the average does not mean the full number on books and was recorded at the worst part of the year when inclement weather, colds and poor clothing inevitably kept some of the children away at this period, the number on books probably far exceeded one hundred. That Ellen Colls, however wise and good she may have been, could not possibly deal adequately with such a large number of children unaided, is obvious. At least one assistant was needed, and indeed when she first began as Headmistress in Cromer, there was a teacher of sorts in charge of the Infants, unqualified, and as was proved by a subsequent Inspector's report, unsuitable. This person was eventually dismissed, but not during Miss Colls' headship, so was of no benefit to her. They were talkative, inattentive and idle, according to Miss Colls, and often had to stay behind after school hours, though one cannot help pitying them, as much of this trouble was scarcely their fault, and was obviously the result of circumstances over which neither they nor Miss Colls had much control. "The school is being worked under considerable difficulties as the supply of desks is insufficient and the desks that are in the school are bad and inconveniently arranged. The Infants are backward and the arrangements for their instruction need improvement. The other children appear to have been taught as well as the arrangements permit"
"More books and better easels should be procured"
"The grant is equal to half the annual expenditure	"
So Ellen worked the miracle and a grant was available; what is more the Church provided some new desks, and the woman (before mentioned) to help with Needlework to relieve the pressure on Miss Colls. The report of the following year twice emphasizes the shortage of books, but it was far into the future before this deficiency was made good. Meanwhile Ellen Colls carried on teaching each and every subject and class, but always giving the due attention to religious matters, as was natural in such a school. Then, quite suddenly in Jan. 1875 she announced her resignation, perhaps because she was tired of the uphill grind, though one feels that this would be out of character; what is more likely is that it was because of family trouble, as was recorded by her in the previous December. So, having firmly established the school as one recognised by Her Majesty's Government, Miss Ellen Hebe Colls left, the first of the eight recorded Headmistresses of Cromer Girls' School. Miss Colls' post was vacant from the end of the second week of the 1875 entries, until the beginning of March, and there is no indication to show who ran the school in the meantime; though I have a strong suspicion that it might be one of the daughters of the Rev. Fitch, probably Miss Edith, who figures so strongly in the later history of the school. "1874 March 2nd. Entered on duties as Mistress of Cromer Girls' School." This, of course, was wrong, for the year was 1875; nor was the mistake rectified until I read through the Log before beginning this short history. This in itself is odd, because the Log Book was open to inspection, not only to H.M.I., but also to the Rev. Fitch and his diocesan colleagues. More peculiar still, is the fact that nowhere does the name of this Headmistress appear in the Log, even though the regulations printed at the beginning of the book state clearly that the names of the staff must follow the H.M.I's reports when they are copied into the book. Not only did the Rev. Fitch forbear to comply with this regulation, in the case of the unknown lady, he also neglected to enter the second report upon her headship. Meanwhile, although we are left in considerable doubt as to her identity, there can be little question about her popularity, and apparent youth. She seems to have been temperamental and more up-to-date in her methods than was Miss Colls. Her writing varies from a small, even, stylish and somewhat modern script, to a larger, more dashing style, carelessly scribbled with great flourishes which extended almost across the page; all of which appears to indicate that she was moody, sometimes careful', and sometimes in a tearing hurry (perhaps to keep an assignment?) and quite often annoyed, as well she might be; for even though she had a "sewing woman" to help with the needlework, plus, at last, an Assistant Teacher for the Infants, and, from certain entries in the Log, that she also had a little help with the teaching of. Religious Knowledge, she had inherited some of the troubles which had so plagued Miss Colls: there was still a very large number of Infants crowded into unsatisfactory accommodation (the quoted number in May 1876 was 85) babies of only two years of-age were still being admitted, and boys over the age of seven were still attending this school, quite illegally. Further, the report of 1875 says "There is still no proper supply of reading books". Besides all this, there were other and fresh troubles: Cromer was fast becoming a fashionable watering-place, and hotels were being built where extra help was required in the summer months. Then there were families like the Barclays, Buxtons, Gurneys and Hoares who had large summer residences in Cromer, and, although they undoubtedly each brought a retinue of servants with them, they all entertained a lot, so that extra help was required in these large houses too, from about the end of June until well into September, and sometimes beyond that. As to where such help came from, well, of course it came from the older girls in the Church School, and many and bitter are the remarks penned by the Headmistress, not only by Miss X, but by those who followed her. As I have already said, our mysterious person was more progressive than Miss Colls; this can be deduced from the extra subjects she introduced namely, Formal Grammar, Poetry, and Natural History. She also made a practice of reading aloud to the girls while they did their Needlework, which must have been appreciated in a school where reading matter was so restricted. But the innovation which caused the most stir was the introduction of Kindergarten Methods in the Infants' Department. These methods (German in origin) were based on activity, involving the development of muscles by using the Kindergarten "toys" - pieces of apparatus which developed the dexterity of the fingers - and which also involved movement and singing. This, although it had been in existence since 1854, was quite new to Cromer, and Miss X records a number of visitors who came to watch the children at work. Besides the delivery of the Kindergarten "toys" Miss X records a new supply of reading sheets for the Infants, a new board and easel, new framed slates, new desks, a gallery (a low raised platform) for the Infants' room, and even a new classroom; though the Inspector in his report refers to it as being "enlarged and improved", which I think was nearer the mark. Gas was laid on in both rooms, which must have been a boon to girls who spent so much time sewing; but where the money came from for all these improvements is another mystery, when presumably the Church was unable to supply the school with the proper amount of reading material. Miss X did not stay long to enjoy all these extra blessings. She left suddenly at the beginning of January 1877 and did not even record her resignation. The Assistant Mistress wrote: "Mistress left suddenly. Log kept by Assistant. Assistant Mistress and P.T. 's carry on school". Our Lady of Mystery remained an enigma until the last. THE ATTENDANCE "WAR" AND THE NEEDLEWORK "FACTORY"
Emma Hill's headship was the second longest known to us in the old Girls' School. It lasted eighteen years, compared with that of Miss Ryde which almost doubled that span. Her writing is angular, plain, uncompromising and unvarying, and, from her entries one may picture her as a typical 'schoolmarm' of her day. That she was both determined and a disciplinarian is evident from the history which emerges as one reads her lengthy entries over a period of years; they were weekly now, instead of daily as before, so that we do not always have the exact date of events, though she usually details them. She had a cane and used it; she also made it plain to protesting parents that she was Mistress and intended to control her own school, which she certainly did; and, after the initial outcry at her methods of punishment and her strict discipline, we hear little more of parental protest. Perhaps they, (like the visiting inspectors) soon realised that Miss Hill was capable, and determined to improve the standard of work in her school. Her opening entry records the size of the school. There were 157 on books. She later remarks (in 1886) that the average attendance was 190, so it is obvious that the school grew in numbers, but this was after attendance became compulsory. Some of the trials which had so plagued Miss Hill's predecessors were still with her, and the first Inspector's Report stresses the old familiar pattern: shortage of reading matter, poor staffing, illegal attendance of babies under three years of age and of boys over seven; but Ellen Hill was made of different material from the two former Headmistresses. Whatever else she may have been or not been, she certainly was a fighter, and she obviously refused to take the blame for circumstances which had been in existence before her time; she probably put some pressure on 'the powers that be' for soon we read that the Managers (first mention of this body) had decided that babies under three should not be admitted, and in the following January she records that boys over seven had been removed from the school. Many more years passed before the reading-book supply was considered satisfactory, and as for the staffing and the subsequent weaknesses of the various subjects taught, it was some time before these matters were righted; but Miss Hill was given extra help in the teaching of R.I. and Arithmetic: Miss Fitch assisted in the latter subject and the visiting clergy took over some of the Religious Instruction. The curriculum did not change very much under Miss Hill. Composition is mentioned, but this was only the reproduction of a story, and Map Drawing is mentioned as something new; but by far the most important subject under this new regime was Needlework. This subject occupies a great deal of space in the Log Book entries of Emma Hill. Even the Infants had to sew and knit, and this was fine stitchery with minute stitches, so small that they could scarcely be seen, and even, and regular. Emma is horrified when she discovers that not a single Infant could "even thread a needle" - poor little souls, what a revolution has taken place since Emma Hill's time, and no one requires little eyes to be so strained, nor the tasks set to be so difficult. Space (or rather the lack of it) will not allow me to deal satisfactorily with the subject of Needlework under Miss Hill, but here is a list of some of the garments for which the girls made their own patterns, cut out and then sewed by hand:- pinafores, chemises, frilled nightdresses, boys' shirts, and babies' shirts; also the girls learned to mark linen with initials, and to darn and patch, for mending was most important in the days when money was scarce, and clothes, table linen and bed linen, etc. had to last a long time. The girls also hemmed innumerable dusters, glass cloths, sheets and other articles and made pillow cases in such numbers that I became convinced that few if any of the articles made, mended, marked and sewed found their way into the girls' homes, but were destined for some important house in the neighbourhood, or some hotel or boarding-house. I say this with some conviction, because when I joined the staff in 1928, the girls in the school were still being supplied with material for sheets and pillow cases by local gentry and others, and the articles made up in school, some by hand, and some machined. "Oct. 4th (1878) 24 dusters and towels hemmed and marked. Oct.18th	12 teacloths hemmed and marked". "Dec.6th 1888 In future only 1J hours will be given to Needlework on the afternoons of Monday, Wednesday and Friday. The time, 2.10 to 2.40 will be spent in Reading by Classes 3 and 4 and in Arithmetic or Poetry by Classes I and 2". From then onwards there is less mention of sewing, though we know it continued to reach a high standard of work, for the girls gained prizes at a local Show at Baconsthorpe. Meanwhile, something more important engaged much of Emma Hill's time and attention. This was the poor attendance, especially during the summer months, to which I referred in the previous chapter; and it was not only in the summer, for, after attendance became compulsory in 1880, there was much antagonism amongst the parents, though oddly enough, before this they needed less persuasion to send their offspring to school. Perhaps (Norfolk-like) they did not like being made to do so! So here we have two causes of bad attendance: the employment of children of school age in hotels and other large houses occupied for the season, plus resentment against the law which disturbed the freewill co-operation of the parents. Not so Emma Hill. She could, and did dare, at any rate as far as the parents were concerned, and resorted to sending to their homes and demanding that the absentees return to school. This she did on a number of occasions. "The irregularity of the attendance makes the work of the school discouraging to the teacher". I deliberately quote this sentence since it is the first time that I find a hint of sympathy towards a teacher labouring under difficulties, The Inspectors of those days were a hard, tough lot who were out to criticise and to see that the Government got its 'value for money'. Naturally, other factors and events affected the attendance, notably the visits of personages, circuses, fairs, wrecks, bad weather, and, inevitably, illness, of which at this time there was a great deal, and of a very serious nature. Scarlet Fever, which was often fatal, Typhoid, and, equally serious, Diphtheria, were common outbreaks; there was also of course Tuberculosis, known at this time as the 'wasting disease' or Consumption. Both homes and schools were insanitary places at this time and personal hygiene was of a very low standard generally. There was a period in the history of this Girls' School, which occurred from about 1878 to 1894 when there were several recorded outbreaks of some of the aforementioned diseases, often prolonged, with one or two deaths. Nor was this the end of such trouble, for as late as the early days of Miss Ryde's headship a case of Diphtheria is mentioned. "Jan.14th to 19th. Weather severe and attendance low". "Oct.26th (1888) Gave each child a 4/- ticket - half the School Fee for past year". This was intended as a reward for good attendance. Secondly, in September 1888, at the insistence of Her Majesty's Inspectors, the Infants' Department, which had greatly grown in numbers, was made a separate school, with its own Head Teacher, a Miss Amelia Offer, who had hitherto been the Assistant Teacher in charge. This reduced the number of children in Miss Hill's school and made it a more manageable unit, with numbers of 111 in 1889, 113 in 1890 and 127 in 1894, for whom she had a recognised teacher as assistant, plus one, two or sometimes more Pupil Teachers. One such who qualified under Miss Hill's tuition was Eva Howes Burton, who was accepted as a Candidate in 1882, did four years as a P,T. and then taught in Miss Hill's school as an assistant teacher until 1894 or '95. Others who qualified in similar fashion were Jessie Wightman 1879-1882, Fanny Sidle 1879-1885, Bessie Deacon 1880-1886, Isabel Ellis 1887-1893 and Flora Turner 1889-1893. Flora left to teach in Aylsham Girls' School, while Bessie Deacon was one of the lucky ones; she went to Norwich Training College to obtain her certificate after teaching as assistant with Miss Hill for one year. Others fell by the way, some for reasons of bad health, such as V. E. Beck, or Agnes Ellis, and others because they failed their exams. "Jul. 11th (1895) School Board Election on Thursday 11th. Room used as a Polling Place". "Jul. 24th. Rev.F.Fitch came into the school and said it was at once to be closed by order of Mr.Fenner, one of the medical men. 118 children present at all this week out of 128 on books. "1905 March 10 Emma A. Hill, Hayes Common, Kent." Miss E. Murphy (no Christian Name mentioned) commenced her duties in the old school in Church Street, for, although it was unsatisfactory, no other building was available as yet. However, I have no doubt that plans for the erection of a new school were being considered, even if work had not already been started on it. That the old building was insanitary has already been made clear, and the late date of starting in September was due to an enforced closure by the Sanitary Authorities. Yet another followed during the first term, when the school was closed from November 11th. until January 6th. 1896. This closure was undoubtedly due to yet another outbreak of Scarlet Fever, as there is an entry in the Log Book in October 1895 referring to girls who had been excluded because of Scarlet Fever in their families. It is difficult at this time to realise how dreaded was this scourge, and how serious both the disease and its results were, for not only was it a killer, it also left behind a legacy of rheumatism and other injuries, which adversely affected its victims for life. "Visited by the Chairman of the School Board." "Register examined and found correct. 28 Oct 95 R L. Randall"
This duty, which was compulsory, was punctiliously carried out by him and his successors as Chairman of the Board. The other Managers, Miss Buxton, Mr. W. J. Burn, Mr. J. Hoare, Mr. B. Rust, and, later, Mr. Bower, Mr. A. Woodward, the Rev. Sheldon and the Rev. Hersee, were equally conscientious in their duties, visiting the school regularly, "sitting-in" on lessons to see that the children were being taught correctly, and even, at times, testing them for the same reason. In fact, they truly were the ruling body and made their presence felt. The School Reports were now entered by the Clerk to the Board, a Mr. A.E.Salter, and were doubtless well-studied and discussed by this public-minded band of men. (1896) "Sept 7 School began in the new school rooms this morning with a good attendance." What a momentous entry, and how little is known of the events which preceded it; but we do know that the work had been carried out by local workmen, some of whom I knew personally in later days; men who took a pride in their work and for whom nothing was good enough but the best. So they built a good, solid building, which stands to this day, and which now houses the Cromer Junior School, but, when first erected, contained three separate schools under its roof, the Boys', the Infants' and the Girls', each with its own Head Teacher. There were no refinements such as are considered necessary today, but this building was considered by all concerned, to be the last word in school accommodation and other schools followed which were built on the same lines, in the years ahead. 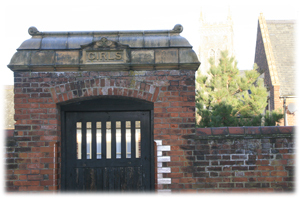 The Girls' School, with its entrance in Cross Street, had three classrooms, the access to which was by corridor, and which measured as follows: the largest room was 48' by 22', the next was 28' by 22' and the smallest was 22' by 20'. The floors were stepped, and furnished with fixed dual desks, each with a shelf beneath for the storage of books. The largest room accommodated 100 girls, the next 60 and the smallest, 40. There was a cloakroom fitted with iron pegs for clothes, a store-room, basins with a cold water supply, and, across the paved playground, a row of mechanically-flushed lavatories. No room was provided for the use of teachers, for in those days they were not supposed to need one, and fifty or more years elapsed before any such attempt was made. The school also had a shelter in the playground for the use of children in inclement weather. This is now a classroom. The accommodation provided for the Infants' and Boys' Schools was on similar lines, and, with its own separate entrance, there was a Board Room, where the School Board members sat to discuss business, and, where later, the Managers of the Council School did likewise. This room disappeared when the school kitchen was made, as it then helped to form its northern end. So a part of the school which had been its hub, so to speak, and where meetings presided over by such persons as Benjamin Rust, Daniel Davison and Lady Suffield, was given over to suet puddings and beef stews! Attendance was still a problem, and Miss Murphy, like her predecessor, had no good opinion of the unfortunate Attendance Officer, but the School Board now introduced an Annual Prize Day when medals and certificates were given for good attendance, and which continued to be held until the outbreak of the first World War in 1914. (1898) "Dec. 21st. Have examined the whole school this week and am satisfied except with the second standard. The step between Infant School Standard I and the Girls' School is too wide." The Headmistresses which followed had the same opinion, but did not express themselves so openly and freely. (1898) "Apr. 22nd. Since October 6 the staff has consisted of an assistant who takes St II and the object lessons and a pupil teacher for St III leaving St IV V VI VII for the mistress. Exactly half the school - 69 out of 138 - was in these standards which have dwindled very slowly till now five girls in St VI VII have not returned after Easter holidays. These are 14 and 15 years old and though sorry to lose the best their absence is a distinct relief as a little more individual attention can be given to the remaining 58." (One wonders how on earth she managed to give 58 girls of varying ages and attainments any attention at all!) On June 8th she writes again: "There are now seventy-three girls in the four upper standards. Happily the Candidate and the Candidate on probation have grown quite useful." One of these two Candidates was undoubtedly Dora Stibbons, and the other may have been Grace Chapman, who is referred to as Monitor, a term which gradually superseded that of Candidate. The former subsequently became an assistant teacher in the Girls' School, and when Miss Ryde retired, was made Headmistress; the latter was to be a future Headmistress of the Infants' School. So 'coming events cast their shadows before'. Miss Murphy also records two instances when the other departments had holidays when she had none, but the real humiliation came when the Inspectors' Reports were received by the other departments and not by her until she had been told of their reception by "the pupil teachers of the Infants' School". One can imagine her feelings at such an insult, for insult it undoubtedly was, whether deliberate or not. She carried on for another term but left at the end of the next one. N.B. Miss Stibbons did not complete her training at this school. She was probably transferred to Overstrand.